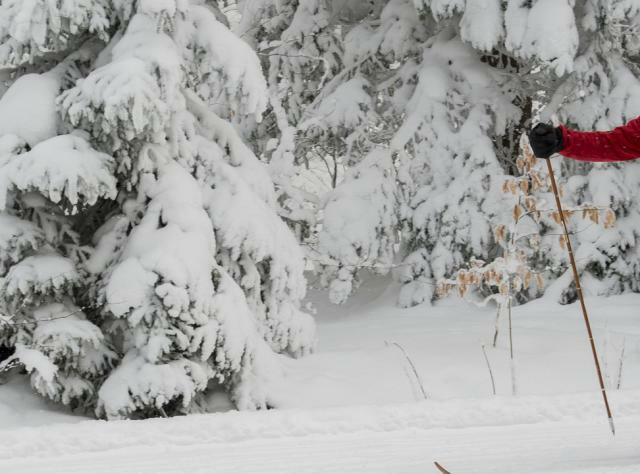 Cross-country skiing is one of the best ways to see New York&apos;s winter landscape. Just north of New York City, you&apos;ll find trails for all levels, including those on the grounds of the Mohonk Mountain House. Traverse the 19-mile Catskill Scenic Trail or explore Pineridge Cross Country Ski Area, where 30 miles of groomed trails and backcountry skiing in the foothills of the Taconic and Berkshire Mountains. Lake Placid&apos;s Olympic Sports Complex at Mt Van Hoevenberg, one of the premier venues of North America, has 31 miles of impeccably groomed trails for all levels. Lapland Lake is a Finnish-flavored resort with trails designed by a former Olympic skier. 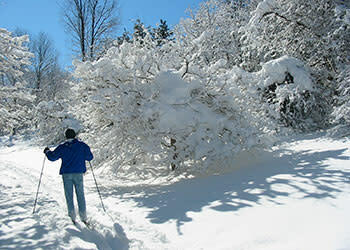 Garnet Hill Lodge&apos;s 34 miles of cross-country trails, from novice to expert, include a lighted trail for night skiing. Trails at Wellesley Island State Park in the Thousand Islands-Seaway region, follow miles of shoreline. In the Snowbelt, east of Lake Ontario, lake-effect snow covers the entire Tug Hill Plateau with an annual average of 300 inches. Cross-country ski and trail information is available at SnoCountry Ski Areas of NY; and for state-owned land, at XC Ski with DEC. You can also view or order our Winter Travel Guide now!